Fresh fruit aromas of apricot and peach slices with notes of lemon and green apple. Pretty notes of honey and wet nutmeg, and the mouth is round, clean, and pleasant with baked apple, honey, and lemon. This is a classic Albariño which is good young, but actually improves over two to three years and remains quite drinkable for up to five years. Owner Juan Gil comments that the wine really starts to come into its own in June/July, and he actually prefers it 18 or more months after it's made. A Fefiñanes "vertical" of three or four vintages can provide some most interesting surprises. Founded in 1904, Palacio de Fefinanes is housed inside a spectacular baronial palace which sits on the lovely main square of coastal Cambados. The facility was built in 1647 by vicount of Fefiñanes Gonzalo Sarmiento Valladares (1583-1659) and is currently owned by Juan Gil Careaga. Palacio de Fefiñanes was the first producer to bottle wine under the D.O. Rías Baixas denomination. 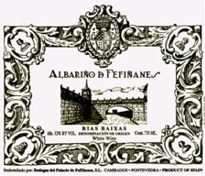 The label design dates from 1928 and shows an engraving of the Fefiñanes Palace. The winemaker is Cristina Mantilla. "Clean, mineral-laced Albariños from a producer housed in a baronial palace." Produced in the Rias Baixas region, where the vineyards are quite windy due to the proximity of the Atlantic Ocean. It also provides acidity and freshness to the wine. The winery has only a token acreage, and buys its Albariño grapes from producers under long-term contract and with technical assistance from the winery's enologist. They make two 100% Albariño wines: Albariño de Fefiñanes, a young traditional style Rías Baixas white (30,000 bottles/year); and 1583 Albariño de Fefiñanes, aged six months in 600 liter sherry butts (4,000 bottles/year - annual production: 100,000 liters). Year after year, local critics rate Albariño de Fefiñanes as one of the best.